The US organization Global Exchange has named Philip Morris to its list of "Most Wanted" Corporate Human Rights Violators of 2005. According to the World Health Organization, tobacco is the second major cause of preventable death in the world. Nearly five million lives per year are claimed by the tobacco industry, whose products results in premature death for half the people who use them. Among tobacco companies, Philip Morris is notorious. Now called Altria, it is the world's largest and most profitable cigarette corporation and maker of Marlboro, Virginia Slims, Parliament, Basic and many other brands of cigarettes. Philip Morris is also a leader in pushing smoking with young people around the world. Philip Morris has consistently misled consumers about the dangers of its products. Documents uncovered in a lawsuit filed against the tobacco industry by the state of Minnesota showed that Philip Morris and other leading tobacco corporations knew very well of the dangers of tobacco products and the addictiveness of nicotine, yet they continued to deny these realities in public until the internal company documents were brought to light. To this day, Philip Morris deceives consumers about the harm of its products by offering light, mild and low-tar cigarettes that give consumers the illusion that these brands are "healthier" than traditional cigarettes. Philip Morris has actively targeted the world's youth by researching smoking patterns and attitudes and targeting youth as potential customers. Marlboro cigarettes are the top brand for youth in the United States. Although the company says it doesn't want kids to smoke, it spends millions of dollars every day marketing and promoting cigarettes to youth. Overseas, it has even hired underage Marlboro girls to distribute free cigarettes to other children and sponsored concerts where cigarettes were handed out to minors. As anti-tobacco campaigns and government regulations are slowing tobacco use in Western countries, Philip Morris has aggressively moved into developing country markets, where smoking and smoking-related deaths are on the rise. According to a study by the Harvard School of Public Health, tobacco's killing fields are shifting to the developing world and Eastern Europe, where most of the world's smokers now live. Preliminary numbers released by the World Health Organization predict global deaths due to smoking-related illnesses will nearly double by 2020, with more than three-quarters of those deaths in the developing world. Meanwhile, Philip Morris' profits continue to grow. In the third quarter of 2005 alone, Altria's net revenue was $25 billion, up from 2004 in large part due to the high performance of Philip Morris USA and Philip Morris International. Not too long ago, when municipalities across Alberta were adopting no-smoking bylaws, there was an organization called the Canadian Property Rights Association that predictably turned up at council meetings across Alberta to lobby against such bylaws. The Canadian Property Rights Association has, thankfully, disappeared from the face of the earth, and I wouldn't be surprised if I heard that the demise had something to do with a connection that was revealed between this organization and former Canadian Alliance leader (and possible Minister of Foreign Affairs) Stockwell Day. A storm came up during the Leaders' Debate when Prime Minister Paul Martin said that he wanted to amend the Canadian constitution to remove the "notwithstanding clause". During the press scrum after the debate, Conservative Leader Stephen Harper let a cat of equal size out of the bag. He said that he would like to amend the constitution to protect "property rights". Here are five press reports of the Grim Reaper's appearance at the Emerging Tobacco Markets 2005 trade show in Kuala Lumpur. There will be another one of these trade shows in Sao Paulo, Brazil, November 14-16, 2008. British American Tobacco, the multinational that supplies Canada with Player's, du Maurier, and Matinee, is closing all of their manufacturing facilities in Canada, and moving production to Monterrey, Mexico. A BAT spokeswoman insisted that the taste of their products would not change. It's safe to assume that the toxicity won't change, either. Story from the Globe and Mail: Imperial Tobacco plants to shut down (sorry, fee required). No mention of BAT's until-recently-secret manufacturing facility in North Korea. Rothmans and JTI-Macdonald still manufacture cigarettes in Canada. Response from Physicians for a Smoke-Free Canada: Imperial Tobacco's closure of tobacco plants is an opportunity to say "good buy". After the Supreme Court of Canada made a 9-0 decision upholding British Columbia legislation making it easier to sue tobacco companies, all of Canada's major print media followed the tobacco industry's party line in criticizing the decision. The columnist most up front in this was Michael Campbell, who has a column in the business section of the Fraser Institute mouthpiece Vancouver Sun, and a program on CKNW called "Money Talks". In Campbell's case, money doesn't just talk, it libels. Campbell invented a fantasy about an "anti-smoking Gestapo", and the Sun printed it. Here's a response to Campbell's name-calling: Michael Campbell, Tobacco Industry Sycophant. 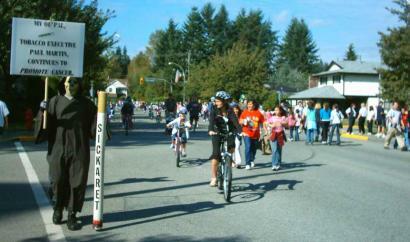 A few days prior to the 25th Anniversary Terry Fox Run (TFR), held September 18, 2005, Airspace Action on Smoking & Health learned that, among the celebrities scheduled to attend and/or participate in this year's Terry Fox Hometown (Port Coquitlam) Run were Canadian Prime Minister Paul Martin and B.C. Premier Gordon Campbell. It just so happens that Airspace President Errol E. Povah is a huge fan of Terry Fox, and has run in more than 20 previous TFRs... and has volunteered (picked up Canadian Springs Water, returned the empty jugs afterward, etc.) at a couple others. He proudly wears his rather vast collection of TFR t-shirts throughout the year. And so it was that, with some trepidation, even after a great deal of soul-searching and wondering (right up to the last minute) if we were doing the right thing, etc., we decided to "move forward" (one of Gordo's favorite expressions... even when he is, in fact, going backwards) with our plan to conduct an Awareness and Educational display at the 2005 Hometown Run. We are a small group of very sensitive and caring volunteers who have dedicated a huge chunk of our lives to the extremely worthwhile and rewarding anti-tobacco movement (we are NOT anti-smokers!). While we recognized that some people might be offended by our presence at the TFR - and some were - of those who expressed an opinion, the vast majority gave us huge thumbs up! To those who were offended, we suggested they vent their anger toward both Paul Martin and Gordon Campbell... and toward those (albeit few) individuals -- presumably spectators, as opposed to run participants -- who were smoking at the site! I don't care whether they're outside or not, nor how addicted they might be: Anyone who smokes anywhere near a TFR site, on run day, is disrespectful! You see, Terry died trying to find a cure for cancer. The specific type of bone cancer Terry had is called osteogenic sarcoma. All bone cancers, combined, currently kill about 150 Canadians each year. Just for a moment, try to imagine that there was one single product out there - available virtually 24/7, from your local grocery store, 7-11, pharmacy, gas station, corner store, etc. - that caused 85% (or 128) of all bone cancer deaths. How long do you think that product would be allowed to retain its legal status, and remain on the open market? In terms of the number of deaths caused by a specific form of cancer, lung cancer tops the list. Just a few years ago, it surpassed breast cancer as the leading form of cancer death in women; and for every man who dies of prostate cancer, five die of lung cancer. Lung cancer currently kills about 20,000 Canadians each year. Now, just for a moment, try to imagine that there was one single product out there - available virtually 24/7, from your local grocery store, 7-11, pharmacy, gas station, corner store, etc. - that caused 85% of all lung cancer deaths - that's right, about 17,000 prematurely dead Canadians, each and every year! Okay, now stop imagining... because such a product really does exist. It's called tobacco... and the deadly combination of the most addictive drug known (nicotine) and a toxic soup of more than 4,000 chemicals (40 of which are known human carcinogens) is conveniently delivered -- via cigarettes, cigars, pipes, chewing tobacco, etc. - 24/7 from virtually any store near you. And, as if that isn't bad enough, the "Lung cancer is the biggest killer of smokers" myth still persists: Smoking-induced heart disease kills more smokers than lung cancer... currently, at the rate of about 21,000 Canadians per year! As stated earlier, Terry died trying to find a cure for cancer... his cancer, any cancer, ALL cancer! Paul Martin and Gordon Campbell are not only doing little or nothing to make Terry's dream come true, other than throwing a few million taxpayer dollars at the problem (I don't know about Gordo but, according to the Vancouver Sun, Martin couldn't even be bothered to walk more than about two blocks of the PoCo event, after which he chatted with the media, then left) but, in terms of tobacco, they are, quite literally, promoting cancer! Big business rules, in both Ottawa and Victoria, and few businesses are bigger than Big Tobacco! Martin and Campbell are nothing more than puppets of the nicotine cartel... and as such, it is their job to very aggressively promote cancer! We have dealt with Paul Martin's very direct links to the cartel on many previous occasions, most notably in the Summer, 04 issue of our newsletter, the Breathers' Digest (available online: Unrepentant Tobacco Executive Elected Prime Minister). Gordo's connections aren't quite so blatant: Unlike Martin, Campbell was never a tobacco executive, but you wouldn't know it by his actions/inaction. One of the first major acts of the Campbell government was to, within a couple of months of first being elected in May 2001, gut the WCB No Smoking Regulation. It was not part of their pre-election platform, nor did they have any mandate whatsoever to do it but, in a precedent-setting move, then-Labour Minister Graham Bruce - for the first time in the 87-year history of the WCB - interfered with and over-ruled the WCB by gutting the No Smoking regulation... most notably, by allowing servers to spend up to 20% of their shift in a Designated Smoking Room (DSR). That decision was based on no medical or scientific evidence whatsoever: There is no safe level of exposure to second-hand smoke, period! But whatever figure they chose, it really didn't matter, just so long as it ultimately achieved the government's desired objective: Render the regulation useless and, at the same time, turn back the clock on tobacco control by 15 to 20 years. Then-Health Minister Colin Hansen stood by and said/did absolutely nothing as Bruce, with Gordo's blessing, gutted the WCB No Smoking regulation. And he did nothing else, positive, in terms of tobacco control either. Shame on him! Think all of this is just Airspace propaganda? Not! The Canadian Cancer Society recently conducted a study, clearly showing that, over the past 4 ½ short years (among all Canadian provinces and territories), B.C. has fallen from first to ninth in tobacco control. And Canada, under Paul Martin, fell from top spot long ago. Airspace will continue to do anything and everything it can to bring public attention to these extremely disturbing high-level political connections to the Merchants of Death at the Nicotine Cartel... and if that means the Grim Reaper has to attend Terry Fox Runs carrying his 5-foot "SICKARET" and a placard that says, "TERRY FOX DIED TRYING TO FIND A CURE FOR CANCER" on one side and, "MY OL' PAL FORMER(?) TOBACCO EXECUTIVE PAUL MARTIN CONTINUES TO PROMOTE CANCER" on the other, then so be it. Shame on Campbell and Martin! People for Ethical Treatment of Animals (PETA) has discovered plans by Philip Morris/Altria to build a new reasearch and development facility in Richmond, VA, and the research to be done will include animal testing. Here's PETA's story: Philip Morris to Build New Research Facility: Bad News for Animals. The story also reveals that Philip Morris is getting huge tax break from the City of Richmond for this. PETA is correct in pointing out that this is "bad news for animals". Unfortunately, PETA suggests that Philip Morris do their research on human volunteers instead. This would be bad news for humans. We already know that cigarettes kill, and so do the tobacco industry's own scientists. There isn't any compelling need to add to the body of knowledge that already exists on this subject. While the debate about smoking on patios rages in Vancouver, my partner and I recently went out for dinner in Tsawwassen. As we approached the front entrance of the local White Spot, I noticed what appeared to be a recently-added-on patio, on the front of the building. I automatically assumed it was, like most patios, a smoke pit... and we chose a seat inside. It wasn't until we were leaving that we asked the hostess about the patio... and were very pleasantly surprised to learn that it is, in fact, smoke-free. A big thumbs up to the owners/managers of that particular White Spot for leading the way and voluntarily doing what will, one day soon, be the law... everywhere. Besides once again being reminded of the hazards of making assumptions, my only criticism would be: Any establishment with a smoke-free patio should proudly advertise it, loud and clear. Smoking kills some 5 million people around the world every year, But it doesn't bleed so it doesn't lead. We get occasional reminders about smoking's devastating impact on health when a Yul Brynner, a Nat King Cole, a George Harrison - or a Peter Jennings or Peter Gzowski - dies but, for the most part, families suffer their tragedies in private. The nicotine industry acts with impunity, but it's not too late to begin demanding it be held responsible for its deadly actions. Unregulated, slender, deadly sticks of tar and carbon monoxide are killing scores of Canadians every day. That fact alone should make it into print and onto broadcasts and TV newscasts regularly. Peter Jennings and Peter Gzowski, at heart both good men and good reporters, would approve. Fresh allegations rock BAT as six-year investigation by the Mounties leads to publication of secret letters. Here's an article from The Guardian about it. Airspace Action on Smoking and Health is dedicated to making the Tobacco Industry a health hazard of the past. It is a member-supported society in the Province of British Columbia, Canada.